9 August 2011 – The United Nations is moving on two fronts to counter the worsening food crisis in the Horn of Africa, with an immediate infusion of food in an area where 640,000 children alone are threatened with acute malnutrition, and longer-term steps to spark an agricultural recovery. “It is vital that we not only save lives today but also save the livelihoods on which people's lives depend tomorrow,” said Rod Charters, UN Food and Agriculture Organization (FAO) senior emergency and rehabilitation coordinator for the region. UN agencies are calling on donor countries, the private sector and individuals to urgently close a funding gap of nearly $200 million for the crisis, which has hit war-torn Somalia particularly hard. The UN World Food Programme (WFP) has provided aid to nearly 8 million people in the region in the past five weeks and is targeting 11.5 million out of more than 13 million people affected by the drought and famine, with governments and partners tending to the rest. Today it started a series of nine airlifts to Mombasa, Kenya, carrying a total of 800 tons of high-energy biscuits (HEBs), enough to feed 1.6 million people for a day. The biscuits are being pre-positioned for onward delivery to vulnerable people throughout the region, where scores of thousands of Somalis are seeking relief in overcrowded refugee camps in neighbouring Kenya and Ethiopia, both of which have also been affected by the crisis. WFP aims to deliver over the next two months 2,000 tons of fortified food to fight acute childhood malnutrition, 2,000 tons of HEBs, and 10,000 tons of fortified cereal by air and road to Somalia. This follows an initial airlift of 86 tons to Mogadishu, Somalia’s capital, enough to feed more than 30,000 malnourished children under age five for a month. Looking beyond the immediate crisis of saving the lives of the acutely malnourished, many of them children under five, the FAO will host a high-level meeting in Rome on 18 August to agree on steps to spark a short-term agricultural recovery, such as cash for work for agricultural and water harvesting, seed distribution, vaccination and animal feeding, irrigation and food storage. These actions will transition into support to governments’ medium- to long-term plans, building resilience over the long haul. The agency has already asked for $161 million to save the lives and livelihoods of millions of farmers and pastoralists across the drought-struck region but has so far only received or had commitments for around $57 million, leaving a $103 million shortfall. “When you see the sheer numbers of animal dead bodies along the road you know that this means that people have less capacity to buy their food today and tomorrow,” Cristina Amaral, Chief of Operations in FAO’s Emergency Operations and Rehabilitation Division said. The Rome meeting sets the scene for a pledging conference called by the African Union in Addis Ababa on 25 August. Of the funds being sought, $70 million is intended for Somalia. Meanwhile the UN High Commissioner for Refugees (UNHCR) yesterday sent its first chartered plane in five years into beleaguered Mogadishu, with emergency aid for scores of thousands of displaced people, including 31 tons of shelter material such as plastic sheeting for shelter, sleeping mats and blankets, jerry cans and kitchen utensils. A second flight is scheduled to arrive on Thursday and a third to follow next week. 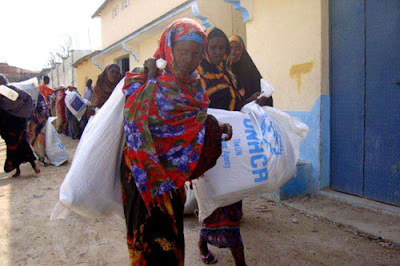 UNHCR has been shipping its relief items to Mogadishu by sea and by land but, due to the dramatic rise in the number of those uprooted by famine and conflict in recent weeks, it decided to airlift supplies to save time. An estimated 100,000 Somalis have fled to Mogadishu over the past two months, joining more than 370,000 displaced people already there. Like FAO, the agency is also facing a shortfall. Of the $145 million it has sought to provide aid until the end of the year, it has received or has firm projections of only $65 million, covering less than 45 per cent of identified needs for Somalia, Kenya, Ethiopia and Djibouti. “We need the funding support to continue to enable us to replenish our emergency stocks inside Somalia as they are being rapidly depleted as we deliver much-needed aid across southern Somalia,” said UNHCR Representative to Somalia Bruno Geddo. In Ethiopia, the agency has moved some 4,000 Somali refugees from the overcrowded Dollo Ado camp in the remote Ogaden region to a new site. More than 78,000 Somalis have arrived in Dollo Ado since January, overwhelming reception capacities. The relocation comes amid efforts to control a recent outbreak of suspected measles in the Dollo Ado camps. UNHCR and its partners are conducting screening and measles vaccination for all children between the ages of six months and 15 years. More vaccines were airlifted in today with support from the UN Children’s Fund (UNICEF) and the Ethiopian health ministry. “One of the challenges in the response to the outbreak is that the refugees are not in the habit of seeking medical attention for the sick,” UNHCR spokesman Andrej Mahecic said in Geneva. But he added that the suspected outbreak still rates relatively low as a cause of mortality in the camps, behind diarrhoea, respiratory tract infections and acute malnutrition. UNHCR, UNICEF and other agencies are also providing emergency assistance in the far larger Dadaab camp complex in Kenya, whose mainly Somali population has swelled to nearly 380,000 in recent months, including 40,000 arrivals in the past month alone. In Geneva, UN World Health Organization (WHO) spokesperson Tarek Jasarevic warned of the high risk of disease due to the lack of potable water, the living conditions in overcrowded camps and malnutrition.